For International Volunteer Day, we want to shine a light on all our support volunteers; the chaperones, administrators, evening appointments secretaries, marriage preparation assistants and coordinators…you keep the centres in England, Wales and Gibraltar running. Your work is of tremendous value to all of us at Marriage Care. To celebrate International Volunteer Day, we wanted to hear from one of our volunteers. Eno Majomi, a volunteer chaperone in Blackheath, tells us about her experience of volunteering with Marriage Care and what being a volunteer means to her. The photo shows Eno (middle) after a powerlifting competition in France last October. What made you want to join Marriage Care as a volunteer? I joined Marriage Care because of the work they do by helping families stay together as well as those about to make a start as a couple. Marriage Care recognises that at some point in a couples’ relationship, they will face difficult times and they are providing that service to everyone who needs it regardless of their faith or financial status. I felt there is something beautiful about that and I wanted to be a part of it. What role do you do in your centre? I help out as a chaperone at our Blackheath Centre and my role enables counsellors to work with couples; our counsellors can’t see clients without the presence of a chaperone. So I help with welcoming clients before they meet their counsellor and book them in for their next appointment, as well as answering any queries they might have before and after they see the counsellor. What do you enjoy the most about volunteering at Marriage Care? Seeing the transformation, like when a couple comes in for their first session it can sometimes be quite difficult for them but then as the weeks go by you see the smiles on their face; with both people deciding on their next appointment together, often joking. That’s just one of the things that makes it worthwhile, knowing I was in some small way apart of that transformation is so rewarding. What are the challenges to your work as a volunteer? My biggest challenge is not being able to find a chaperone to cover me when I can’t be at the centre; knowing that we then have to cancel an appointment is difficult for me. How does volunteering impact the rest of your life? I started volunteering with Marriage Care approximately eight years ago when my boys were young. Volunteering gave me the chance to take on a different role and it helped to keep me mentally stimulated, what was also great about it was the fact that our clients come from a wide variety of different backgrounds. Spending time with my family, travelling, going to movies, and eating out. I am wife, mother of two boys 17 and 14. 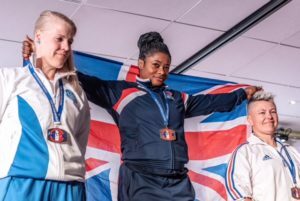 I am powerlifter and part of the GB Team, hold a few British records, gold and silver medals, plus also currently the European and World Champion in my category (M1) and weight class (72kg).